Sie sind hier: Neue Mitte > Außenpolitik > EU & Euro > Press Release: Stop the Gaza Siege, Finally! 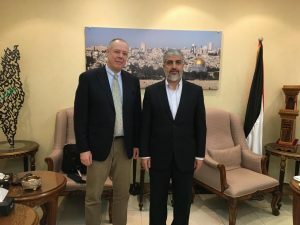 Hörstel´s objective is now to see this guarantee declaration incorporated into the manifesto of Hamas, which is published in the internet. 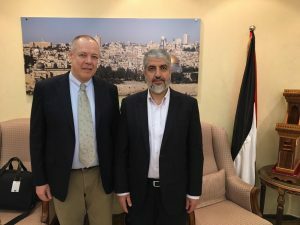 Hörstel comments on it: “This clarification of Hamas policy will become an important pillar for the solution of the Middle East conflict.” At the same time Hörstel is criticizing the classification of the Hamas as a terrorist organization in the EU and other predominantly Western countries. Hörstel comments: „Not only isn’t Hamas a terrorist organization at all – on the contrary, the worldwide recognized death toll is speaking a totally different, appalling language: The terrorists are rather residing in Tel Aviv, Washington and other Western capitals.“ Above all else the severe Israeli stonewalling policy has transformed Gaza into a “concentration camp with occasional bombardment of the population”. Hörstel is decided to help terminate this siege urgently. “At the Gaza fence snipers of the Israeli army shoot at the heads of Palestinian protesters who peacefully demonstrate in a distance of 500 meters”, Hörstel complains. Every week specifically marked medics and journalists are being heavily injured by targeted shots. Israel´s armed forces spokesmen have repeatedly pointed out, that all shots from the army snipers are carried out exclusively upon order and based on existing unambiguous documents. Israel has imposed the Gaza siege when Hamas took over the government after globally approved legal democratic elections in 2006. 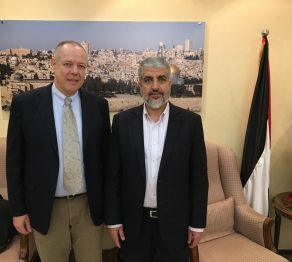 Khaled Mashaal fell a victim to a poison attack by the Israeli secret service Mossad in the Jordanian capital Amman in 1997; however, after an intervention by the former king Hussein he was rescued by an antidote, which the then Mossad head Danny Yatom had to bring to Amman in person. Prior to the conversation with Mashaal, Hörstel had met the Vice Foreign Minister of Hamas, Ghazi Hammad end December last year in Istanbul. Photographs being attached to the press release are free for use, provided the source „Christoph Hörstel“ is mentioned.